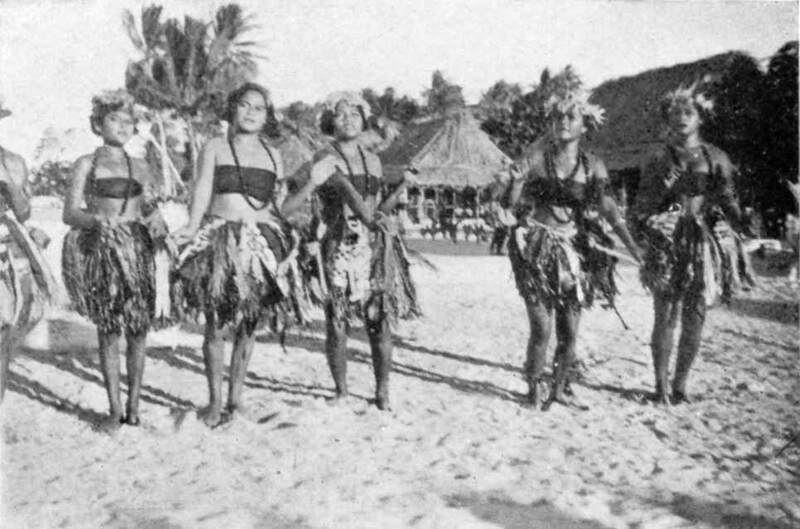 Scenes of paradise is a series of old pictures from Tonga. 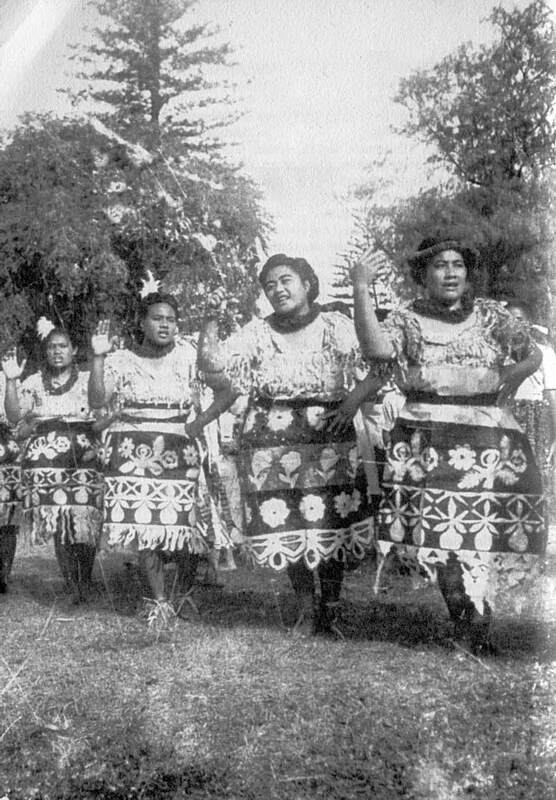 And some not so old pictures from other Pacific cultures, islands, people. And some new pictures from plain fantasy. Move your mouse over a scene to get download size and copyright information. Click on it to see full size or download. 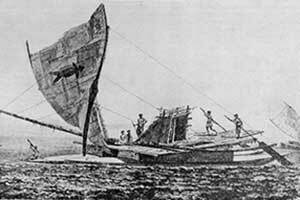 A tongiaki during Captain Cook's second Pacific trip. 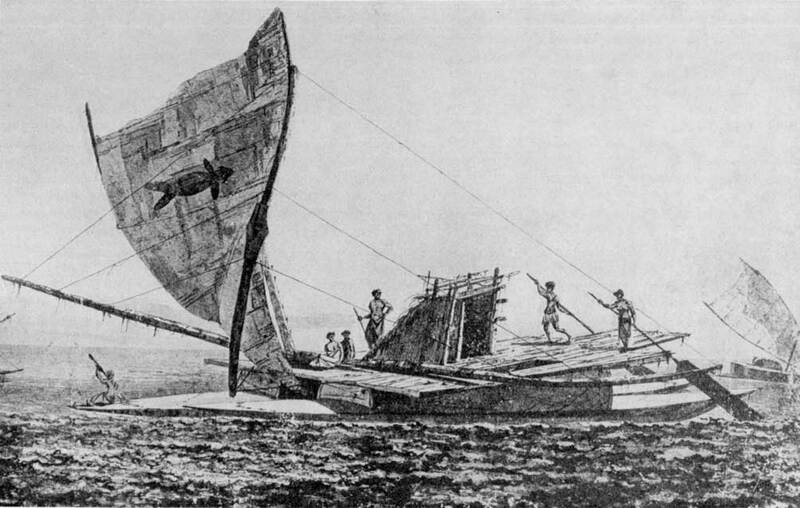 A tongiaki was Tonga's version of the South seas outrigger canoe, a huge ship of about 20m long, used for trips between the islands and to Sāmoa and Fiji and beyond. 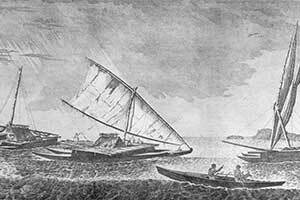 The boat at centre is a waqa rua (or drua), a Fijian design. 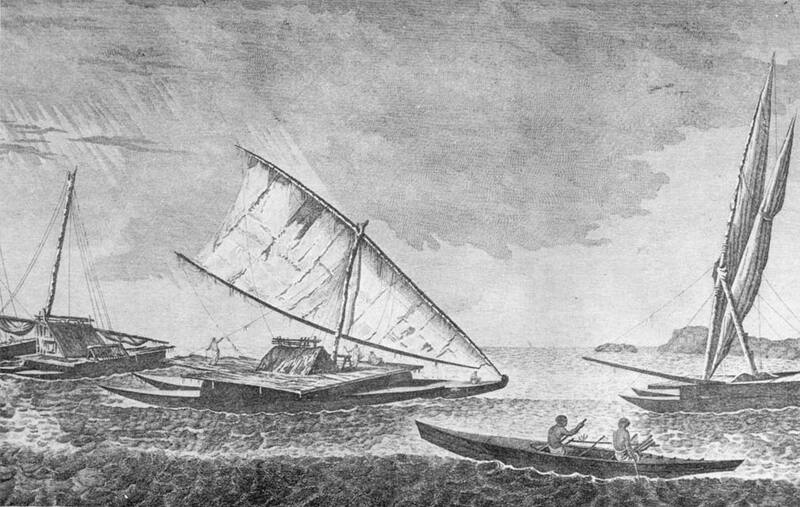 The idea of the catamaran, 2 smaller boats tied together to make a larger more stable platform to withstand the swell of the big ocean, is an Oceanic invention. 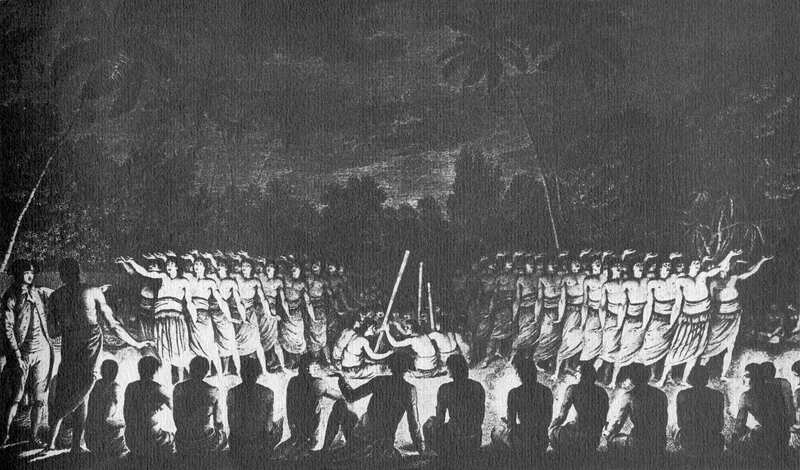 Once dusk descended over Haʻapai, Captain Cook and his crew were invited to attend this impressive dance, the like of which are still performed nowadays. 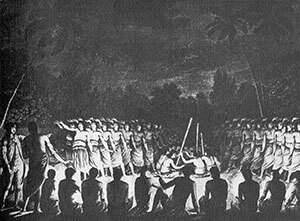 Kava ceremony with king Pau(laho) during Captain Cook's 3rd voyage. Nowadays the people might be more dressed and the roof made of ugly concrete beams and roofing iron, but further nothing else has changed. 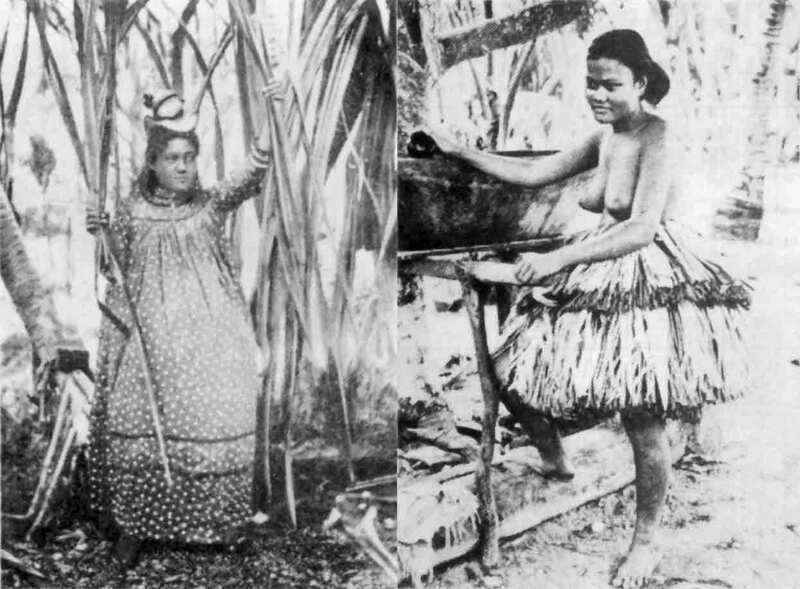 Escaping from the hot, busy village life, these girls have a refreshing bath in one of Sāmoa’s many freshwater streams. Meanwhile having some small talk with each other. 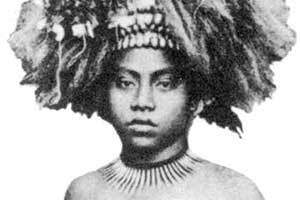 In 1894 the people of Funafuti, Tūvalu, were in transition. 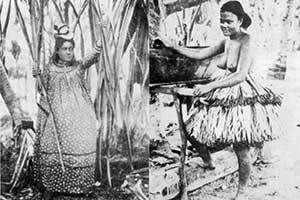 One plucks pandanus leaves on a Sunday in her mother-Hubbard dress and the typical small hat in vogue at that time. While another on a weekday is still in her traditional grassskirt. 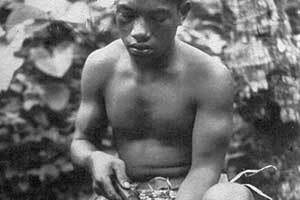 Drinking kava, a peppery juice extracted from the roots of the piper methysticum, is an old Tongan custom. It must be mixed in a wooden bowl, drunk from coconut cups and preferably served by young beautiful girls. 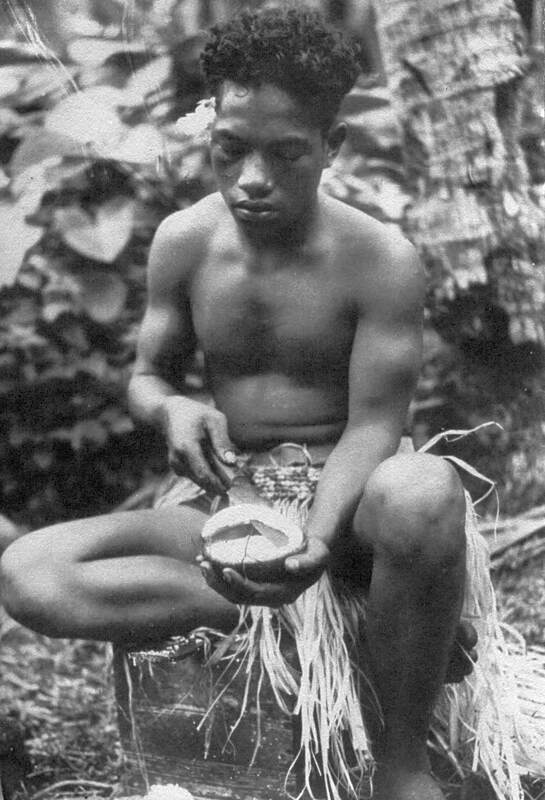 Drinking kava, a peppery juice extracted from the roots of the piper methysticum, is an old Tongan custom. 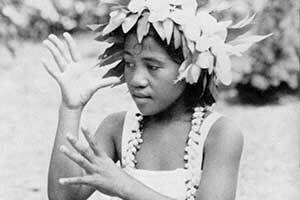 It must be mixed in a wooden bowl, drunk from coconut cups and preferably served by a young beautiful girl. 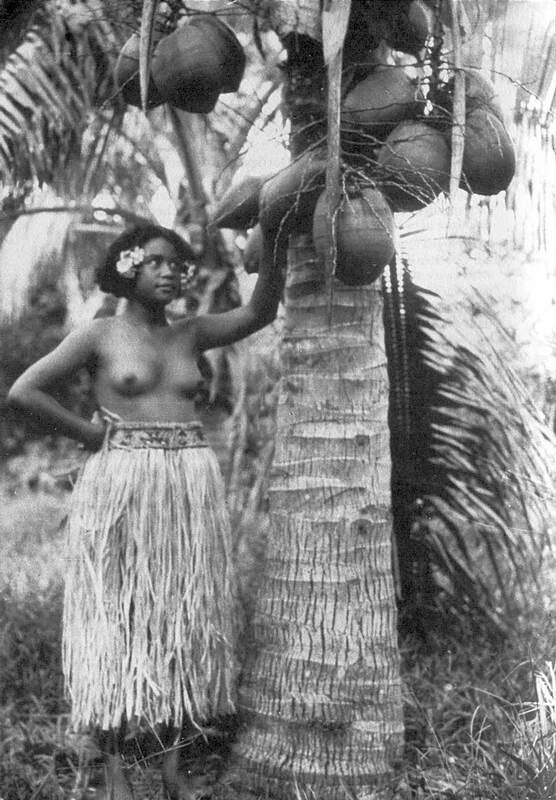 The small islands of Tūvalu, like Nukufetau, are rarely visited. So when someone makes to there, the guest is a worth a celebration, straight on the beach. The meaning of the prehistoric latte stones is not really known. 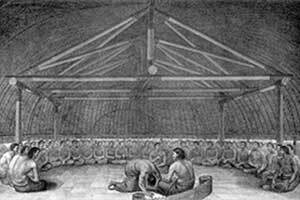 The size of some, like these on Tiniʻan, Marianas, clearly cast doubt on the theory that they were foundations for chiefly houses. 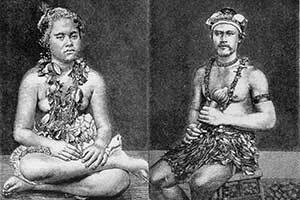 Before the missionaries came with their Victorian squeamishness to Sāmoa, the clothing of the people was much simpler than nowadays. 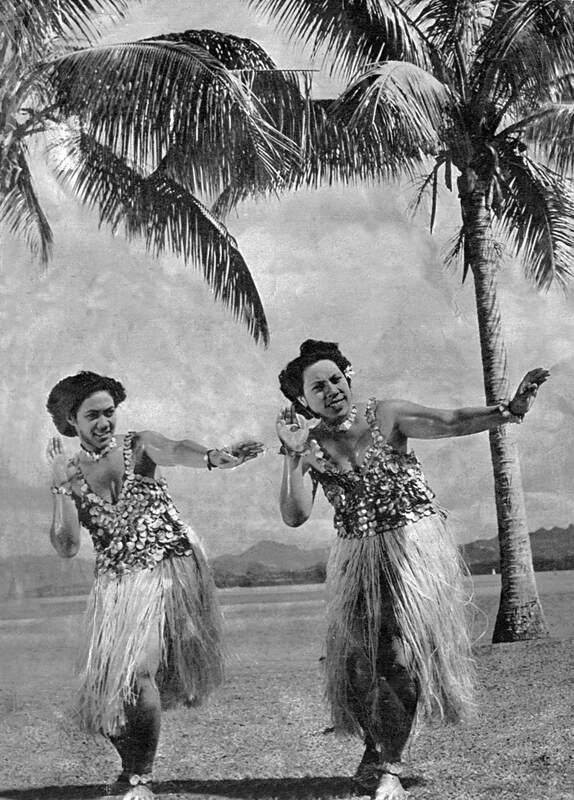 As tissues were none existent anyway, a girdle of leaves was often the only attire. 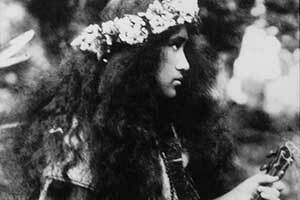 Not many native Hawaiʻians were left over by 1912. 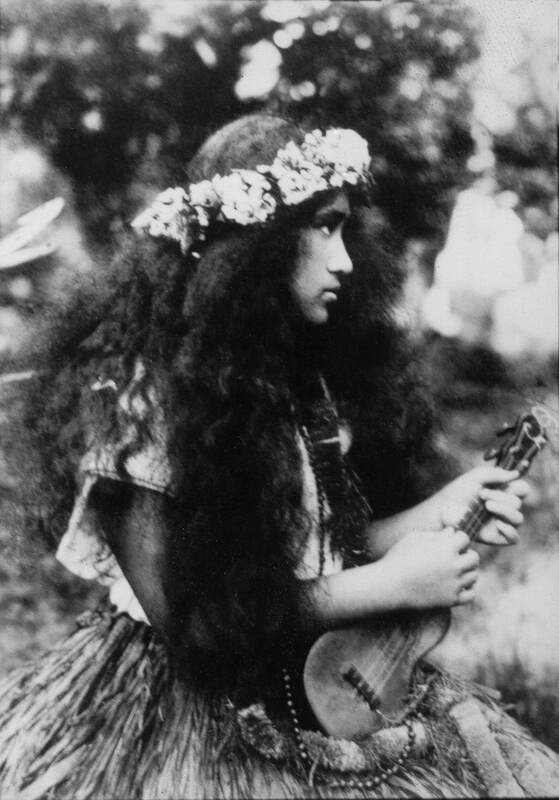 Like this girl with her little 4-stringed guitar, the ʻukulele, her lei (flower hairband) and dressed in her pāʻū lāʻi (skirt of frayed kī leaves). 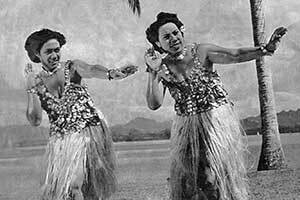 In 1954 Veiongo Fakaua and Paluvavaʻu Tupou, at that time 2 young girls of noble birth were invited to come to London to perform real Tongan dances in front of the then recently crowned queen Elizabeth. 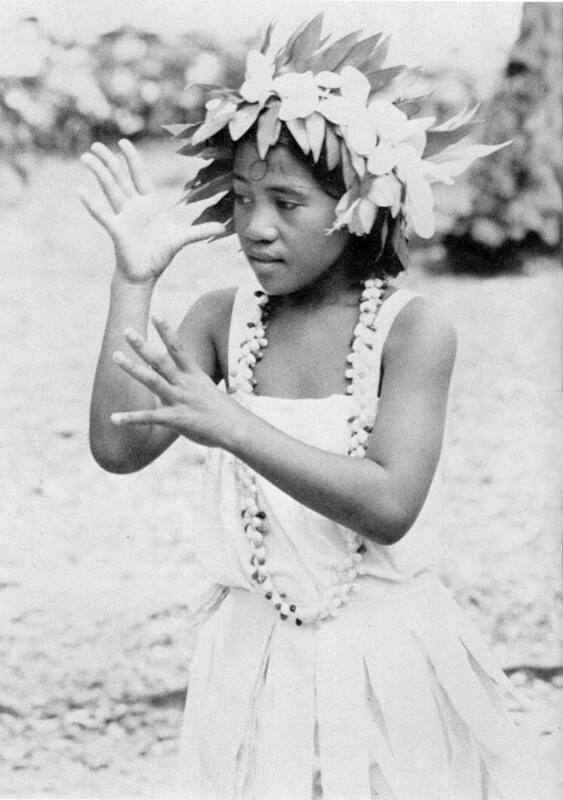 This young girl from Nukunonu, Tokelau, performs a traditional dance. 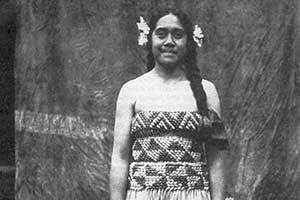 Her necklace, made from shells rather than flowers, shows that she is the inhabitant of only a tiny atoll. Beautifully made fans constructed from coconut leaf fronds as ribs, interwoven with colourful strips of pandanus leaves are still made nowadays as they were a century ago. And still used in the hot season. 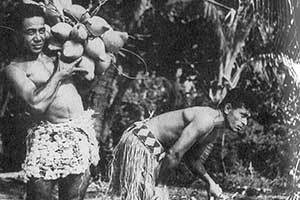 It always has been and still is a daily task for the boys of any Tongan family to open ripe, fallen coconuts, cut out the flesh and feed it to their pigs. The art of making a sisi (ornamental girdle around the hips) has not changed over the years. Strips of blank fau (hibiscus bark) are frayed into the strands, while coloured fau and fā (pandanus leaves) are artisticly plaited together. 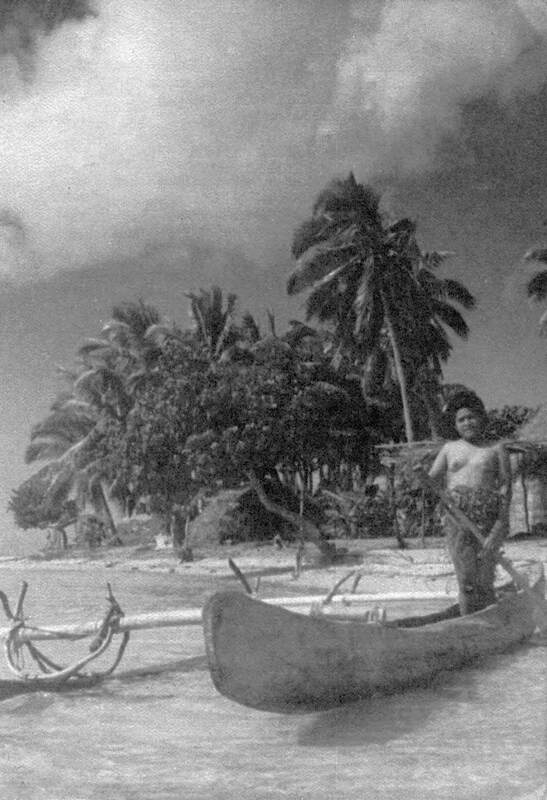 This Tongan fisherman stands along the shoreline, with his bare feet on the sharp rocks of coral limestone. His spear in his hands awaits the fish which will come within reach. 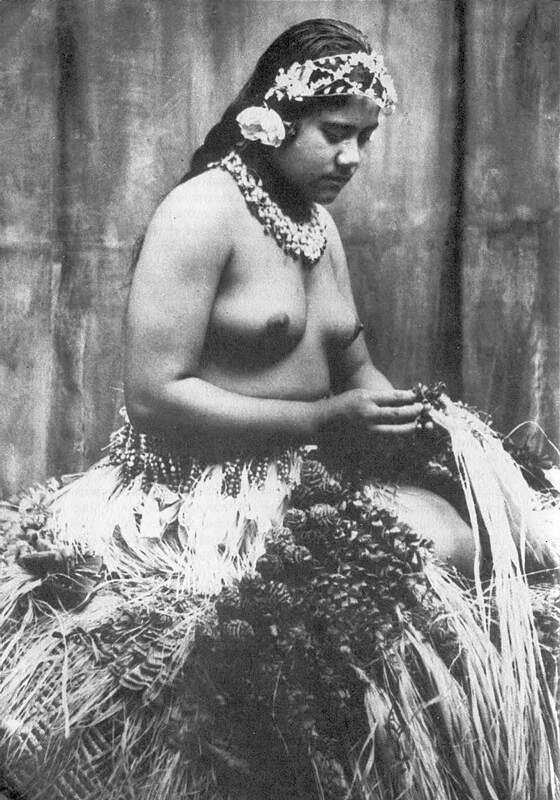 Wearing a skirt of plain leaves is not really tradition. Maybe these girls were told that this was a military camouflage uniform, supposed to hide them. Anyway, military costumes require military greetings. 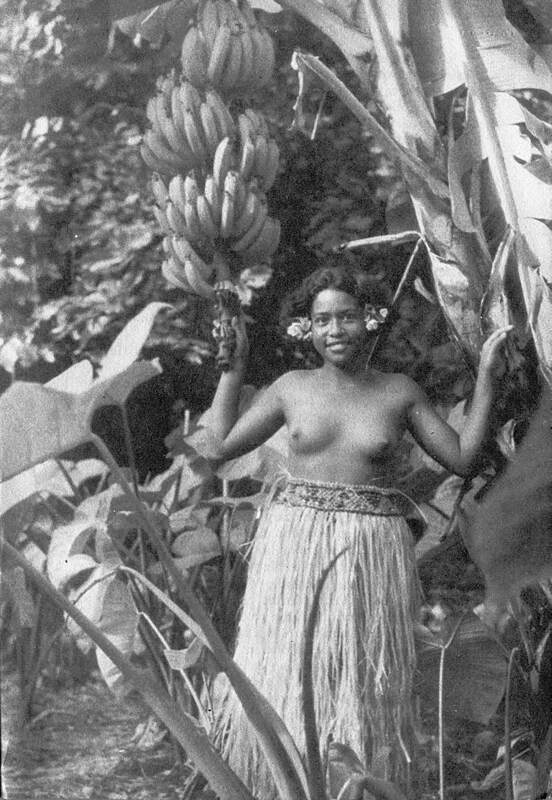 The daughter of the house may still show you the products of the family plantation, but nowadays not anymore in a traditional manafau (grass skirt). Still a ripe banana is not to be despised. 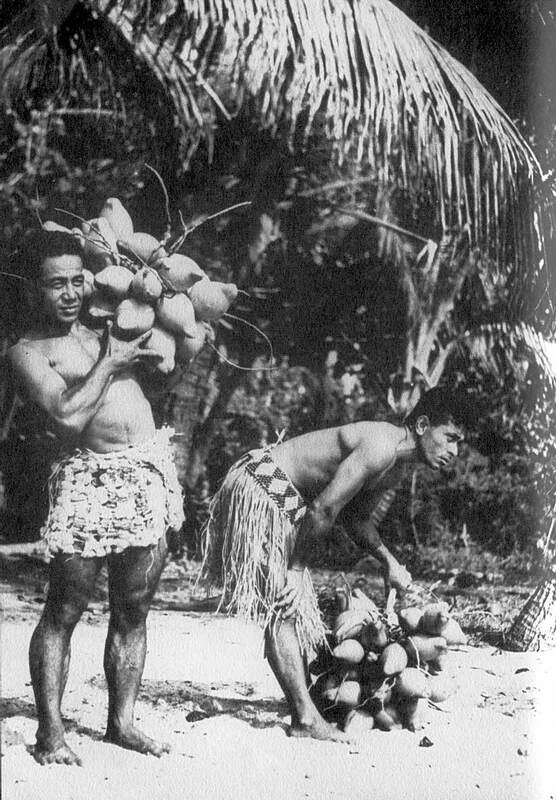 The dwarf palmtree may give dwarfed sized coconuts, but they are not less drinkable. Perhaps these young men were sent into the bush to get some, for a picnic on the beach. 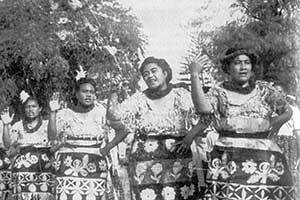 The lakalaka is the most formal of the Tongan dances; now and a century ago, as evidenced by the typical Norfolk pinetrees of Malaʻe Pangai, which were much smaller then than when they were removed around 2000 because of having grown too tall. 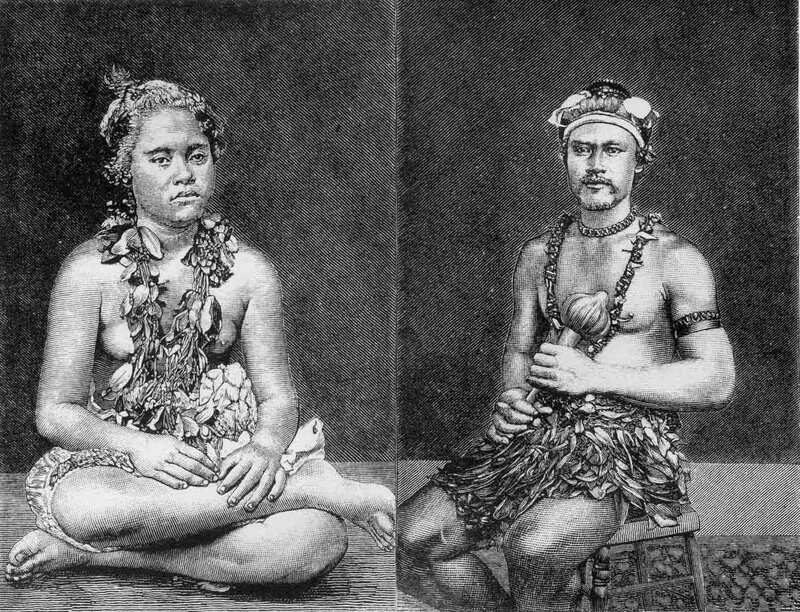 In traditional Tonga girls could go naked from waist up, as long they wore a decent skirt covering their thighs. The photographer must have used some persuasion that this girl wanted to stand in a miniskirt on the roots of a long died and decayed coconut tree. Nothing tastes better on a tropical day than green coconut. 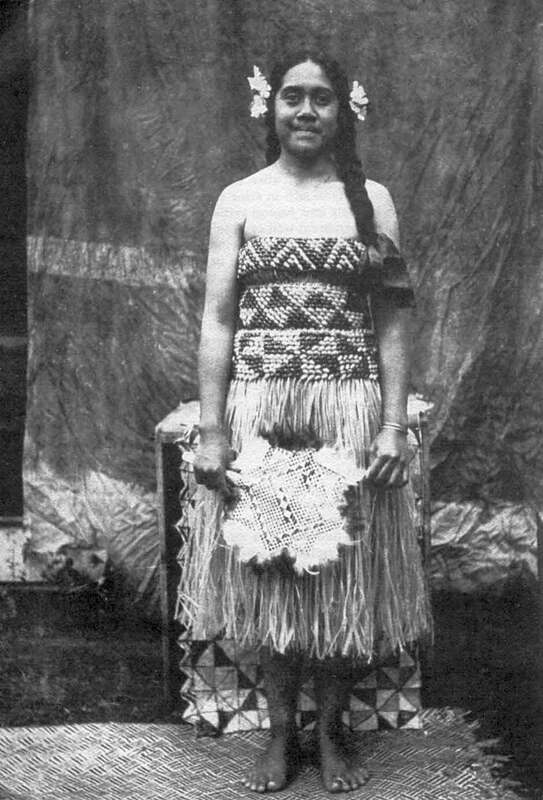 Poor girl, even when dressed on her best in her sisi kakala (skirt woven from sweet smelling flowers), she only had to pose for the camera. Her nut is not opened, and not a drip has crossed her parched lips. 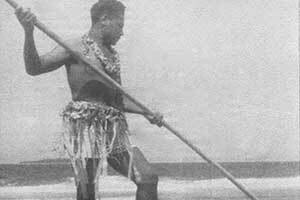 The small pōpao (outrigger canoe) has always been the tool for fishermen to go out onto the calm waters of the lagoon. 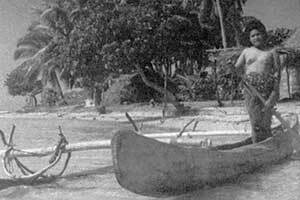 Nowadays these canoes have become rare, but in Tonga they have not died out yet. 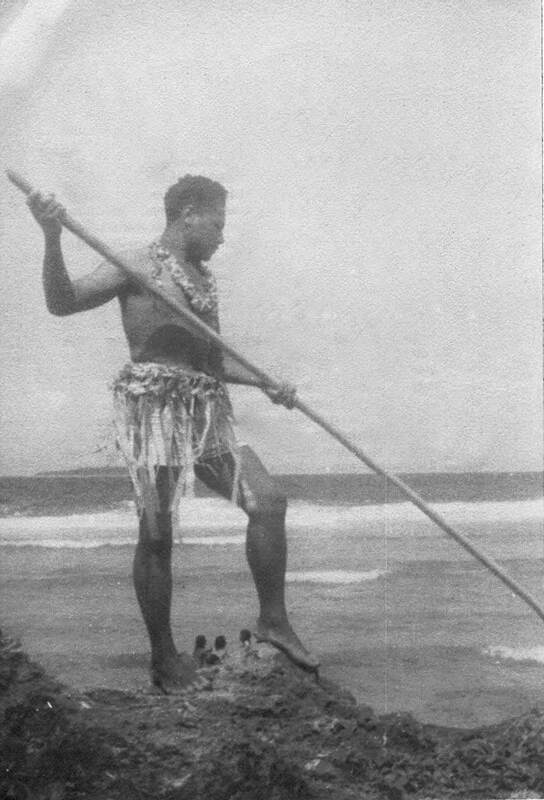 Notice the U-shaped outrigger attachment, typical for Tonga. 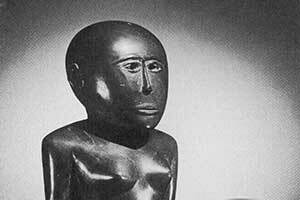 This 40 cm high wood statue or tamapua, attributed to come from Haʻapai, is one of the very few artifacts having survived the missionary idol burning. 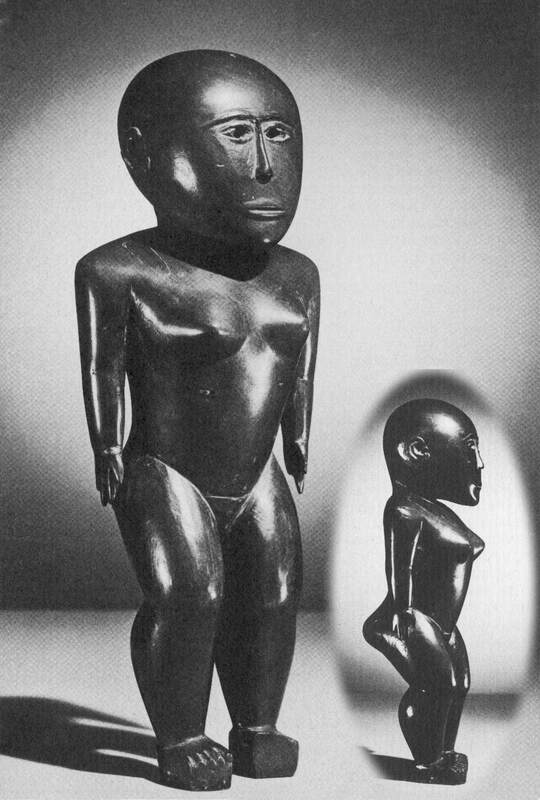 The small nose of this goddess may be European influence, but the enlarged head and bent knees are typically Polynesian. The I-kiribati, the people from Baanaba included, were known for their fierce warriors and their passionate dancing. This man is ready for both. In that time, 1911, the island was still green. Nowadays it is mined barren and the people have been moved to Rabi. 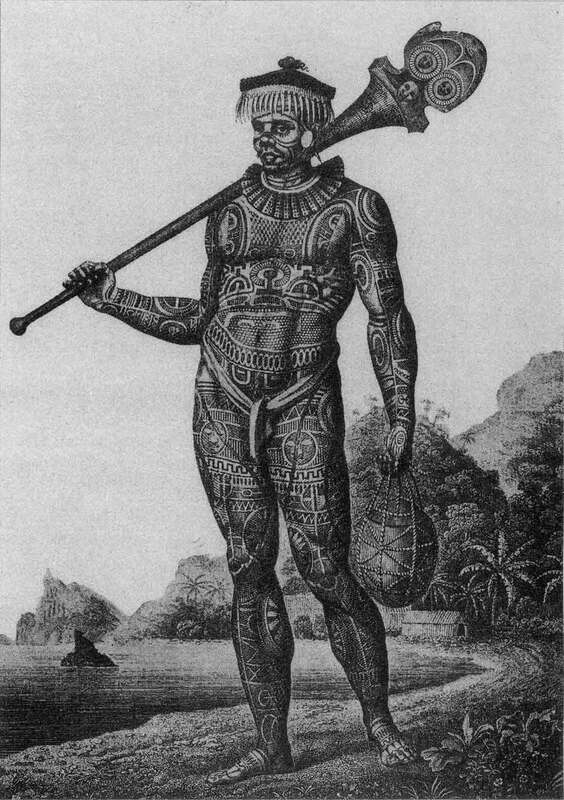 On the tropical islands where people cannot show off with fancy clothing, because they do not need any, tattoos were their body decoration. 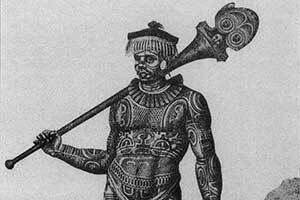 The inhabitants of the Marquesas islands were among the most densily tattooed of the whole Pacific. 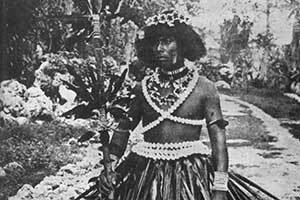 By tradition every village in Sāmoa has a young lady to represent them at official occasions, usually the daughter of the chief. 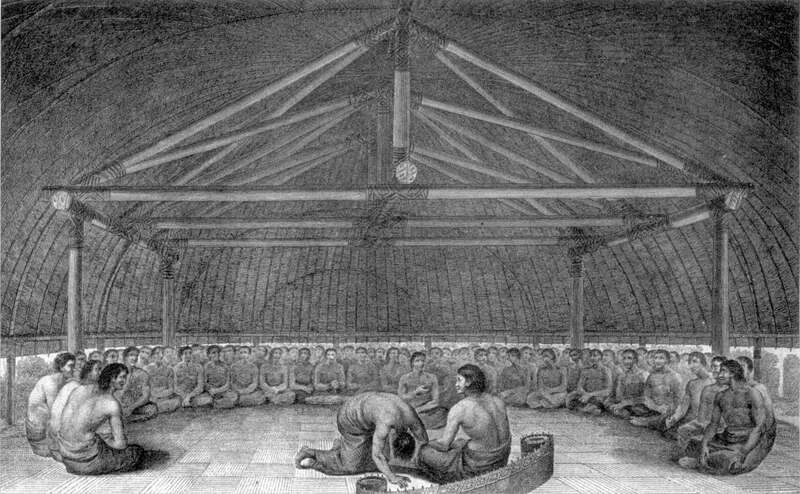 That is the taupōu. She is brought up to be most beautiful and best educated girl of the village, ceremonially dressed in the most ornate costume available. 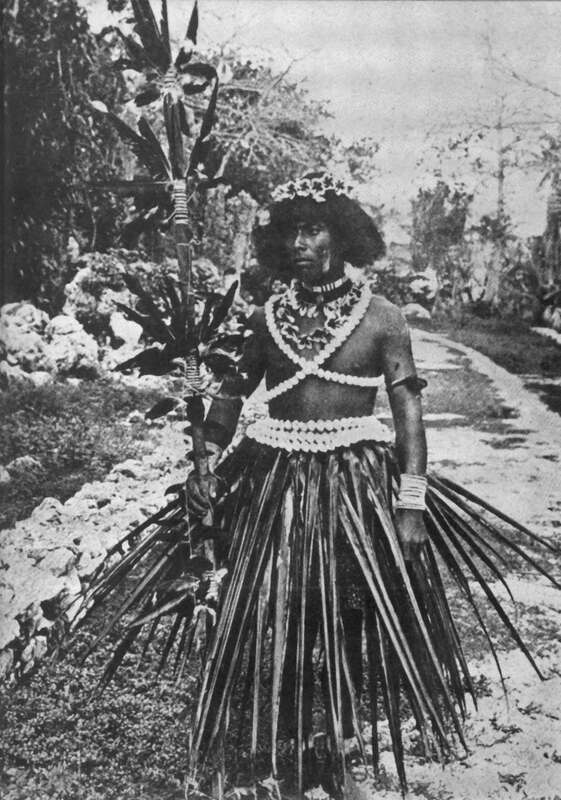 The daughter of the house may still show you the products of the family plantation, but nowadays not anymore in a traditional manafau (grass skirt). Still a green coconut is not to be despised.